An interesting chapter in the story of the First Nations of Simcoe County is that of the Potawatomi. Potawatomis constitute a small percentage of the population of the Beausoleil First Nation on Christian Island. Other Potawatomis moved from Christian Island around 1880 and now make up part of the population of Moose Deer Point Reserve in Muskoka. 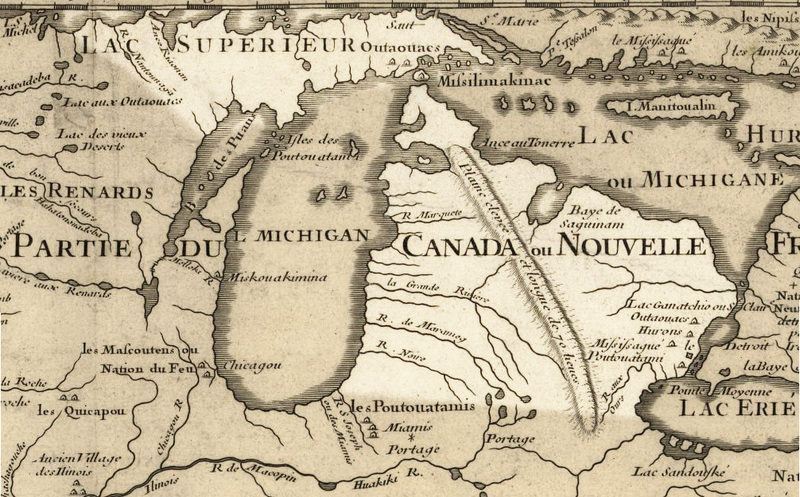 The homeland of the Potawatomi was in the lower peninsula of Michigan. When Europeans first arrived in the Great Lakes region, the Potawatomi were locked in a deadly struggle with the Neutral nation who inhabited south western Ontario. The Neutral people maintained friendly relations with both the Wendat and the Haudenosaunee in order to concentrate their military energy in attacking the Algonkian speaking peoples to their west. In 1651, the Haudenosaunee removed the threat of Neutral aggression from the Potawatomi homeland but the Five Nations soon replaced the Neutral as the enemies of the Potawatomi. As a result of Neutral and Haudenosaunee aggression, the Potawatomi had moved to the west by the 1640s and 50s. Like the Odawa and Wyandot, the Potawatomi moved from place to place for the next fifty years before returning to their homeland. The Potawatomi are close relatives of the Odawa and Ojibwe, all being part of the Algonkian language group (these related languages are referred to as “Anishinaabemowin”). The oral histories of the three nations, in fact, state that they were once one people. During the late 17th and early 18th centuries, the three groups moved closer together as a result of the attacks of the Haudenosaunee and the demands of the fur trade. The Potawatomi, unlike the Ojibwe and Odawa, lived in villages and these settlements provided safe havens for refugees and migrants. During this time, the three nations formed a loose confederation called the Council of Three Fires. The three members of the Council prospered as a result of the fur trade and their strategic geographic position. The Potawatomi homeland began to expand at this time and continued to do so until the time of the War of 1812. Tecumseh was a Shawnee chief whose people suffered greatly at the hands of the new American Republic. The “big knives”, as the First Nations called the Americans, were land hungry. The Republic’s burgeoning population constantly pushed at its frontiers. The Shawnees, like many other nations, had been forced out of their territorial estate. A loose confederation of First Nations had been formed in the American Northwest in 1783 known as the Western Confederacy. Aboriginal resistance, however, was severely shaken at the Battle of Fallen Timbers in 1794 and the confederation was abandoned. Tecumseh’s dream was to revive the notion of a confederation of aboriginal nations in the North West. Only through uniting could these nations resist American territorial aggression. The Potawatomi began to face American demands on their territory in the wake of Fallen Timbers and the appeal of Tecumseh’s vision attracted many to the cause. Tecumseh’s dream was destroyed with the defeat of First Nations and British forces at the Battle of Moraviantown (aka Battle of the Thames). 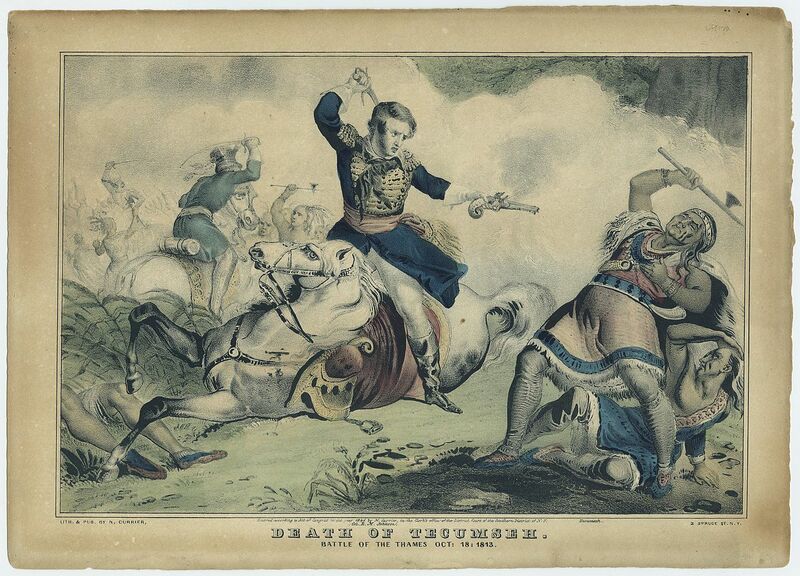 Tecumseh was killed and the participation of First Nations diminished thereafter. Although the Americans could not claim victory in the War of 1812, the British abandoned their First Nations allies in the Treaty of Ghent that followed. The erstwhile British Allies were left to the mercy of the “big knives”. By 1837, the Republic had swallowed the whole of the Potawatomi estate and resettlement west of the Mississippi was the lot of this proud nation. Many rejected transport to the strange lands of the West and looked, instead, to British North America for refuge. The border had meant very little to First Nations peoples before 1812 and travel to Manitoulin Island or Penetanguishene to receive “presents” from the British Crown had been a yearly ritual, even for nations living in American territory. Many Potawatomis crossed the border into southwest Ontario, settling with their Ojibwe cousins on Walpole Island near Sarnia. Others took a more northerly route to Manitoulin Island and Penetanguishene. When Chief Assance’s band, now under Kadegwegwon, left Beausoleil Island for better prospects on Christian Island, in 1856, they discovered that a small group of Potawatomi had preceded them. This group had resettled on the Island in 1832. These people were accepted by the Beausoleil band. The Potawatomi were Traditionalists while most of the Beausoleil were Roman Catholics. This difference may have caused some friction between the two groups. Around 1880, nineteen families of Odawa and Potawatomis left Christian Island in order to found Moose Deer Point Reserve in Freeman Township in the District of Muskoka. Some families remained behind on Christian Island and, today, count themselves as members of the Beausoleil First Nation. The presence of Potawatomi people in Simcoe County is a legacy of the Council of Three Fires and of the American policy of relocation in the Old North West.